It's just four hours until Liverpool contest arguably the biggest game of their season so far, and Trent Alexander-Arnold has just received some significant news. The 18-year-old Scouser has been told by Jürgen Klopp that he will make his full Premier League debut that afternoon - against Manchester United at Old Trafford. He must now begin the process of readying himself to help settle the latest battle between England's biggest rivals in front of 70,000 Mancunians, with just over 3,000 people who actually want him to succeed present. But, before that, Trent knows immediately who to call: his mother. "When I called her and told her, she just started crying," he told Liverpoolfc.com. "That’s when I realised, it’s not just me who it’s happening to, it’s everyone around me as well. It was a good feeling to have. "She just told me to go on and do the best that I can and don’t worry about what happens – and that’s what I did." 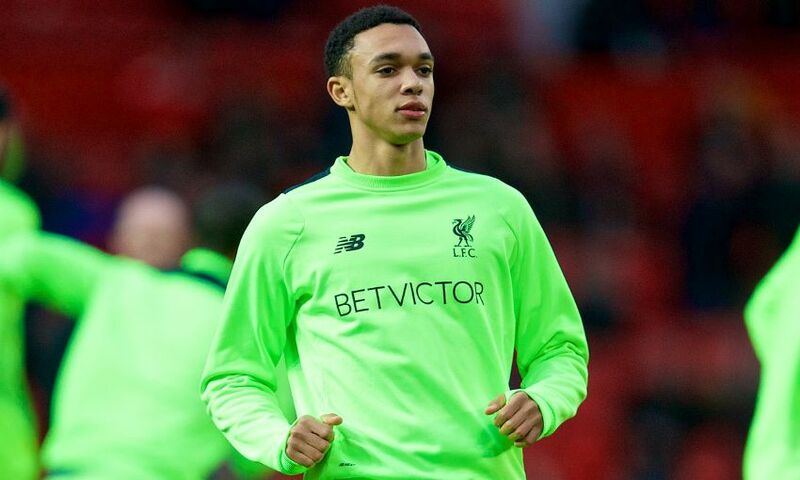 A late decision over the fitness of Nathaniel Clyne contributed to the last-minute nature of Alexander-Arnold finding out about his inclusion. Although he may have expected a place in the squad, the youngster had very little time to get his head around the idea of starting a world-famous fixture in such an intimidating arena. But Alexander-Arnold believes that may well have worked in his favour. "I wasn’t aware at all," he added. "The day before, we travelled to Manchester and stayed over in the hotel and [the next day] I think about 12 in the afternoon the manager asked me if I was ready to start. "I said 'yeah' and he said, ‘OK, you’re starting’. That’s when I knew and I think it was a good thing knowing so late on because if I knew the day before I wouldn’t have had the best of sleeps." After enduring a couple of shaky moments up against the fleet-footed Anthony Martial early on, the defender settled down and, as he is happy to acknowledge, 'did quite well'. The sight of a teenager coping in such a pressured environment is not a familiar one, of course, but it is yet another result of the unwavering faith of the manager in his youngsters, the player himself insists. The West Derby-raised No.66 says the fact that he and his fellow Academy graduates have grown so used to rubbing shoulders with top stars at Melwood means they are ready to contribute at senior level. And they have Klopp to thank for that promotion. He explained: "I wasn’t too nervous travelling to the stadium or even in the changing rooms, it was just in the tunnel before the walkout when you can hear the crowd but you can’t really see them and you don’t know what to expect. That was when the nerves started. "But as soon as the game started I completely lost the nerves and I was just focused from then on. "Maybe if it was at the very start of the season, when I wasn’t really used to being around such big players and big names, then I think I would have been a bit more nervous and starstruck than I was. "But being around them everyday, you get used to it, and I think that helped me in that I wasn’t starstruck at all and I knew I had to do a job." 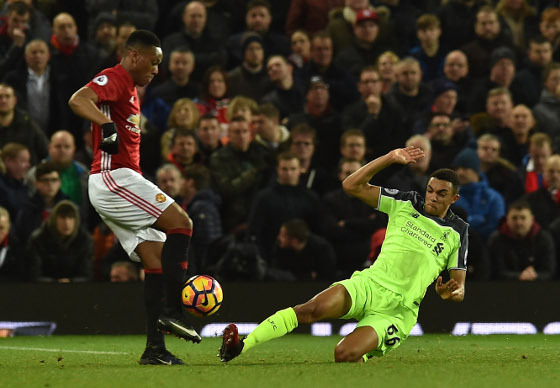 Three days after the blur of Old Trafford, Alexander-Arnold retained his starting berth for a 1-0 FA Cup third-round win over Plymouth Argyle, and put in yet another assured performance on the right-hand side of the back four. The victory at Home Park capped a remarkable few days for a boy who had dreamed of such moments since joining the club's Academy at the age of just six. But he knows the hard work starts now. Klopp is only too keen to stress publicly that his young players have everything to lose should they start to believe their own hype, or fail to maintain the high standards that have helped them reach this point - and those warnings haven't fallen on deaf ears. "There’s always room for improvement and that’s the thing that everyone knows," he commented. "Being a footballer, you can never be satisfied, you’ve always got to try and strive for better because there are always people chasing your position and wanting to be where you are. You’ve always go to try and get better. "Playing in such big competitions as the FA Cup and the Premier League and such big occasions, knowing that [the cup game] was a must-win to go through, I’ve never experienced that much pressure. "It was exciting and I want it to happen again." With that attitude, Liverpool's latest Scouse prospect has every chance of ensuring this is just the start of the story.